Fusion protein corresponding to Human HIF-1 alpha aa 400-550. Hela-DFO treated (0.5mM, 24h) Nuclear Lysate (ab180880) can be used as a positive control in WB. HIF-1 alpha can be a difficult target to work with so we have compiled a summary of all the important information you need to know including useful tips. This can be found in the protocols tab or alternatively click here to download it. For WB, we recommend using positive control samples such as DFO or CoCl2 treated nulcear cell lysates such as ab180880. Ensure cell lysis occurs quickly (within 2 mins) if removed from hypoxia. Loading a high amount of sample (>50 µg) and addition of protease inhibitors (e.g. ab65621) may also enhance detection. This antibody clone is manufactured by Abcam. If you require a custom formulation or conjugation for your experiments, please contact orders@abcam.com. Our Abpromise guarantee covers the use of ab1 in the following tested applications. We recommend Goat Anti-Mouse IgG H&L (DyLight® 488) preadsorbed (ab96879) secondary antibody. WB Use a concentration of 5 µg/ml. Detects a band of approximately 120 kDa (predicted molecular weight: 92 kDa). We recommend blocking for 1 hour with 5% milk in TBST and reducing to 2% milk in TBST for the primary and secondary antibody incubation steps. For primary antibody incubation, we recommend 2 hours at room temperature. We recommend Goat Anti-Mouse IgG H&L (HRP) preadsorbed (ab97040) secondary antibody. Functions as a master transcriptional regulator of the adaptive response to hypoxia. Under hypoxic conditions activates the transcription of over 40 genes, including, erythropoietin, glucose transporters, glycolytic enzymes, vascular endothelial growth factor, and other genes whose protein products increase oxygen delivery or facilitate metabolic adaptation to hypoxia. Plays an essential role in embryonic vascularization, tumor angiogenesis and pathophysiology of ischemic disease. Binds to core DNA sequence 5'-[AG]CGTG-3' within the hypoxia response element (HRE) of target gene promoters. Activation requires recruitment of transcriptional coactivators such as CREBPB and EP300. Activity is enhanced by interaction with both, NCOA1 or NCOA2. Interaction with redox regulatory protein APEX seems to activate CTAD and potentiates activation by NCOA1 and CREBBP. Expressed in most tissues with highest levels in kidney and heart. Overexpressed in the majority of common human cancers and their metastases, due to the presence of intratumoral hypoxia and as a result of mutations in genes encoding oncoproteins and tumor suppressors. Contains two independent C-terminal transactivation domains, NTAD and CTAD, which function synergistically. Their transcriptional activity is repressed by an intervening inhibitory domain (ID). In normoxia, is hydroxylated on Pro-402 and Pro-564 in the oxygen-dependent degradation domain (ODD) by EGLN1/PHD1 and EGLN2/PHD2. EGLN3/PHD3 has also been shown to hydroxylate Pro-564. The hydroxylated prolines promote interaction with VHL, initiating rapid ubiquitination and subsequent proteasomal degradation. Deubiquitinated by USP20. Under hypoxia, proline hydroxylation is impaired and ubiquitination is attenuated, resulting in stabilization. In normoxia, is hydroxylated on Asn-803 by HIF1AN, thus abrogating interaction with CREBBP and EP300 and preventing transcriptional activation. This hydroxylation is inhibited by the Cu/Zn-chelator, Clioquinol. S-nitrosylation of Cys-800 may be responsible for increased recruitment of p300 coactivator necessary for transcriptional activity of HIF-1 complex. Sumoylated; by SUMO1 under hypoxia. Sumoylation is enhanced through interaction with RWDD3. Desumoylation by SENP1 leads to increased HIF1A stability and transriptional activity. Ubiquitinated; in normoxia, following hydroxylation and interaction with VHL. Lys-532 appears to be the principal site of ubiquitination. Clioquinol, the Cu/Zn-chelator, inhibits ubiquitination through preventing hydroxylation at Asn-803. Cytoplasm. Nucleus. Cytoplasmic in normoxia, nuclear translocation in response to hypoxia. Colocalizes with SUMO1 in the nucleus, under hypoxia. We recommend using 5% milk in TBST as the blocking agent, decreasing to 2% milk in TBST during primary and secondary antibody incubation. HIF-1 alpha was immunoprecipitated using 0.5 mg HeLa Nuclear DFO treated whole cell extract (ab180880), 5 µg of Mouse monoclonal to HIF-1 alpha and 50 µl of protein G magnetic beads (+). No antibody was added to the control (-). The antibody was incubated under agitation with Protein G beads for 10 minutes, HeLa DFO treated whole cell extract lysate diluted in RIPA buffer was added to each sample and incubated for a further 10 minutes under agitation. Proteins were eluted by addition of 40 µl SDS loading buffer and incubated for 10 minutes at 70°C; 10 µl of each sample was separated on a SDS PAGE gel, transferred to a nitrocellulose membrane, blocked with 5% BSA and probed with ab1. Secondary: Goat polyclonal to mouse IgG light chain specific (HRP) at 1:20,000 dilution. PVDF membrane was used and blocked for 16 hours in 5% milk. ab1 staining HIF-1 alpha in rat infarct core striate tissue sections by Immunohistochemistry (IHC-P - paraformaldehyde-fixed, paraffin-embedded sections). Tissue was fixed with formaldehyde and antigen retrieval was by heat mediation in a citrate buffer. Samples were incubated with primary antibody (1/1000) for 1 hour at 25°C. An HRP-conjugated rabbit anti-mouse IgG whole molecule (1/200) was used as the secondary antibody. 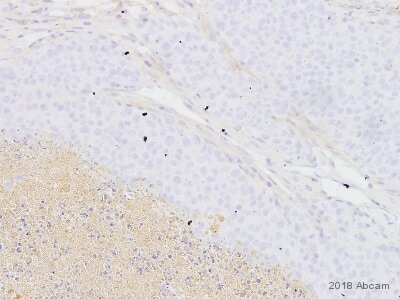 ab1 staining HIF-1 alpha in mouse skin tissue sections by Immunohistochemistry. Tissue was fixed with formaldehyde and blocked with 10% serum for 30 minutes at 22°C; antigen retrieval was by heat mediation in a citrate buffer. Samples were incubated with primary antibody (1/100) for 1 hour at 25°C. An HRP-conjugated Goat anti-mouse was used as the secondary antibody. ab1 staining HIF-1-alpha in MCF7 (Human breast adenocarcinoma cell line) cells treated with metformin hydrochloride ab12084, by ICC/IF. Decrease in HIF-1-alpha expression correlates with increased concentration of metformin hydrochloride, as described in literature. The cells were incubated at 37°C for 24 hours in media containing different concentrations of ab120847 (metformin hydrochloride) in water, fixed with 4% formaldehyde for 10 minutes at room temperature and blocked with PBS containing 10% goat serum, 0.3 M glycine, 1% BSA and 0.1% tween for 2 hours at room temperature. Staining of the treated cells with ab1 (10 µg/ml) was performed overnight at 4°C in PBS containing 1% BSA and 0.1% tween. Goat Anti-Mouse IgG H&L (DyLight® 488) preadsorbed (ab96879) at 1/250 dilution was used as the secondary antibody. Nuclei were counterstained with DAPI and are shown in blue. 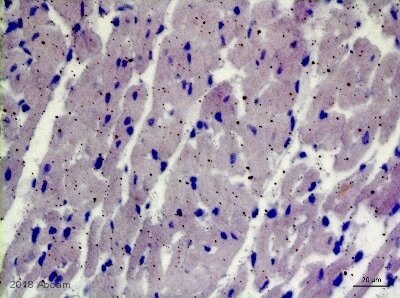 ab1 staining HIF-1 alpha in mouse liver tissue section by Immunohistochemistry (Frozen sections). Tissue samples were fixed with formaldehyde and permeabilized with 0.2% Triton-X100 before blocking with 2% BSA for 30 minutes at 20°C. The sample was incubated with primary antibody (1/200) for 9 hours at 4°C. An Alexa Fluor®555-conjugated Goat polyclonal to mouse IgG was used as secondary antibody at 1/200 dilution. DAPI was used to stain the cell nuclei (blue). ab1 at 1/200 dilution staining HIF-1 alpha in human 293FT cells by Immunocytochemistry/ Immunofluorescence. Cells were fixed in formaldehyde, permeabilized in 0.5% Trition X-100 and blocked in 5% BSA for 1 hour at 25°C. The primary antibody was used at 1/200 dilution in PBS and incubated with sample at 4°C for 12 hours. An Alexa Fluor® 488 conjugated Goat polyclonal to mouse IgG was used as secondary at 1/500 dilution. Flow cytometry using ab1. HeLa (Human epithelial cell line from cervix adenocarcinoma) cells were cultured untreated or with 1mM Deferoxamine (ab120727) for 24 hours to induce HIF-1-alpha protein levels. Cells were then trypsinized, fixed with paraformaldehyde and stained with ab1 (0.5 µg/mL). 1% BSA in PBS was used as the blocking buffer throughout. ab1 was labeled with and anti-mouse Alexa-Fluor® 488 dye. Unstained (black), untreated (red) and DFO treated (blue) cell traces are shown. 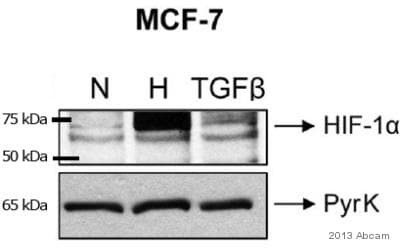 ChIP - Anti-HIF-1 alpha antibody [H1alpha67] - ChIP Grade (ab1)Image from Li X et al., Oncotarget. 2016;7(5):6000-14. Fig 5(D). ; doi: 10.18632/oncotarget.6830. ChIP assays were performed using ab1 to verify the binding between HIF-1α and HREs. Primer 1 (P1) and primer 2 (P2) were designed to detect HREs1 and HREs2, respectively. PCR products were separated by gel electrophoresis on 2% agarose gel. Publishing research using ab1? Please let us know so that we can cite the reference in this datasheet. I have runned into problems with one of your antibodies for Hif 1 alpha (ab1). It binds very unspecific and basically to the whole membrane. I dilute the antibody 1:1000 in TBST 2,5% milk. At the moment we are blocking the PVDF-membrne with 5% milk for one hour room temperature..
Maybe it would work better by blocking with BSA? 1) I think switching to PVDF is a good idea, sometimes when you have high background the membrane switch is a good stratgegy to reduce it. 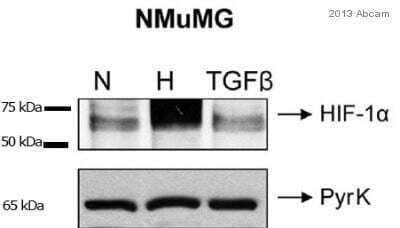 2) We do recommend using milk with this antibody, but I see some customers that reviewed it got good results when doing an overnight blocking step rather than one hour, so I would recommend changing this step as well to reduce the background. I ordered on of your antibodies (HIF1alpha, ref. Ab1) and I would like to know what negative control (tissue) I can use to test it? As indicated on the product datasheet (www.abcam.com/ab1), HIF1 alpha is expressed in most tissues with highest levels in kidney, heart and tumours. However, HIF1 alpha is also known to be an unstable molecule, therefore I would guess that the levels of HIF1 alpha are minimal in normal tissues other than kidney, heart and tumours. I would also suggest to consult the latest literature available through PubMed and other resources in order to find the most up-to-date information about this specific research area. How much homology does the immunogen have with bovine HIF1 alpha? It works in bovine pulmonary endothelial cells treated with CoCl2. The immunogen sequence homology of ab1 is 94% with Bovine. i tried in bovine and rat. In bovine worked well but in rat it did not. The ab1 did not work in either species. I ordered an antibody from santa cruz that is predicted to work in rats. Keep you informed. Please try antibody ab1 with human lysates or cells by making sure the Hypoxia is correctly induced. ab16066 has yet to be tested with Rat samples so I am sorry we do not have any tested data available. The sequence homology between human and rat for amino acid 530-826 is quite high nearly 82% which is OK for antibodies cross reactivity however we cannot be 100" sure. As per your email the antibody works for Bovine, this mean the antibody is OK perhaps it is not good for Rat. Just wondering have you done troubleshooting with rat samples, are you using hypoxia induced samples. Thanks! I will look forward for receiving your feedback. I have 2 abcam antibodies (ab1 and ab16066) and i am trying to blot for bovine, rat, pig, and human cell lines and tissues. Can you tell me which species these antibodies are likely to work ? I prefer the use of ab16066 and I have a particular problem recognizing a rat HIF1alpha. Both of these antibodies are predicted to react with rat and other species as mentioned on the datasheet. If you are interested in testing any one of these in rat species, please let me know I am happy in sending a 100% Abtrial discount code.